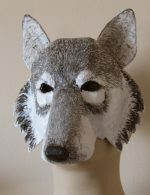 For a fast, easy start, check out my patterns for animal masks and sculptures. 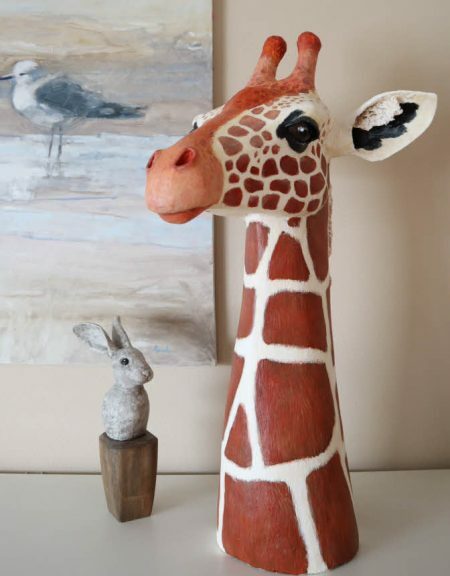 No experience is required to create paper mache art that will be treasured for years. 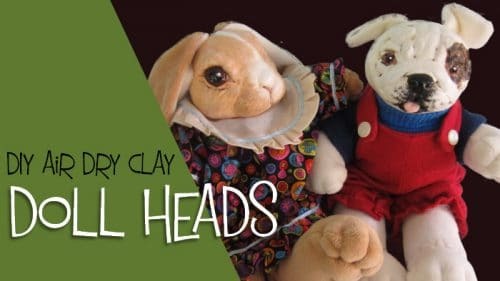 You can find all the traditional paper mache paste recipes on this site, plus my famous paper mache clay recipe (and several new variations). You can always find the recipe you’re looking for under the Recipes link at the tip of the site. Or download my free booklet, The 5 Best Recipes for Paper Mache. 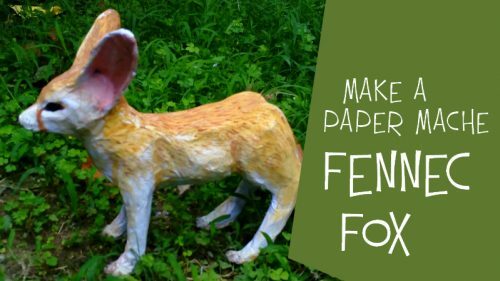 If you’re looking for an idea for your next paper mache project, we’ve got lots – there are over 480 tutorials and projects on this site, and more are added all the time. You’ll find them organized by category on the Blog-Art Library page. If you have a particular project in mind, try the search bar. You will always find the search icon at the top of the site. I’m Jonni Good, the creator of this site and the author of several best-selling sculpting books on amazon.com. You’ll find me on the Daily Sculptors page almost every day, along with many other friendly and supportive folks who love creating beautiful things with this exciting medium. Be sure to drop by and say “hi.” We’d love to meet you. What’s the difference between cooking and non cooking paper mache? I’m making a turtle shell for a Halloween costume so it has to last. Does adding salt help it last longer? Hi Ginette. Salt will help slow down the growth of mold in wet paper mache, but after the paper mache is completely dry and sealed, mold shouldn’t be a problem whether it has salt in it or not. If you live in a humid environment that makes it difficult to dry your sculpture quickly, go ahead and add some salt to your paste. The only difference I’ve found between the cooked and uncooked paste recipe is that the cooked recipe dries clear and smooth, and the raw version leaves a white residue on the surface of the sculpture that has a little bit of texture. Thank you for such a prompt reply. I appreciate your suggestions for the mask transformation. I am looking forward (with some trepidation) to giving it a try. I really want to try the PMC – if I can find non-DAP compound. The 2 big hardware stores nearby are solidly DAP. I have 3 more possibilities. Since this mask is going to be worn by a tree, comfort is not going to be a major concern. Been checking your site for some time. Trying to find some time to delve into Paper Mache for some Halloween decorations. I have a plastic mask that I would like to turn into a goblin. Could I use it for an armature using your Paper Mache Clay? Enjoy your site and all the discussion about various techniques. Hi Sandra. You can do that, but I think masks made with the shop towel mache are more comfortable to wear. Unfortunately, the blue shop towels by Scott are not available everywhere, but they do make great masks. I used the plastic masks as armatures and the shop towels in almost all the masks in my book, in fact. I used a plastic skull instead of the mask form for this portrait mask, but it will give you the idea. And here’s another one. The paste I’m using in those videos is the same as the DIY gesso recipe – and you do need to completely soak the shop towels with the paste, or the mask won’t get stiff enough. But yes, you could use the paper mache clay instead. Or use it for the fine details after the shop towel mache dries. I also had a problem requesting the recipe booklet. I filled the form out with my name and email and kept getting an error message. Martha, could you send me a link to the exact page where you clicked the button to get the form? I really want to get this fixed, but I can’t figure out where it’s going wrong. Jonnie, tried for your free 5 receipts on paper mache. was unsuccessful, but will try you videos for the one on clay, looks exciting. Enjoyed you videos and will continue to watch, got some of your books, hope receipts are in at least one of them. Love your arts pieces, one ones I could see. Hi Alice. Can you tell me what went wrong when you tried to download the recipe booklet? Lots of people have been able to sign up for it, but if there’s a problem with the system I hope you’ll let me know what happened, so I can fix it. You can find the recipes by clicking the Art Library tab at the top of the page. The recipe guide is handy, though, because it lets you print them out or keep them on your computer. Gosh, I have no idea why this is happening. Did you click the buttons on this page? They work when I test them. Has anyone else had this problem? Hiya I recently finished a project of a cartoonish alligator for a family function it was very rushed and its not exactly how I wanted , it’s about 75% paper mache because I used great stuff for texture. I learned alot fornext time. But wanted to thank you was totally flummoxed on how to do it until I ran across your page. Hi Shannon. We would love to see your alligator – especially the texture you mentioned. Do you have a photo you’d like to share? My good friend is visiting from the British Isles. We are working on some pumpkins, eh, leprechauns, and this is our pre-paint stage. Oh! I posted this on the home page! Sorry. Will try again. No, you’re not crazy. And the leprechaun pun’kins are adorable! I’m working on a series of mostly endangered animals to show at the local library next spring. 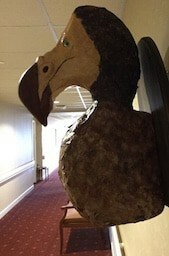 I thought it would be amusing to display the head of an extinct dodo as a trophy. Jonni’s recipe is great. I love it, Andrea! When the show starts, please be sure to come back and tell us about it. We might have some readers who live close enough to go see it. What a fantastic idea! Jonni, do you have any instructions on repairing an NFL bobble head ? No, I don’t. Sorry. But if I had to do it, I think I’d use Apoxie Sculpt. It will be as hard as the original, and it can be smoothed to match the surrounding texture of the head. You might need to go to a hobby store for some of the enamel that’s used for model airplanes, in order to match the original colors. Beyond that, I don’t know how I could help. Good luck with it! Someone gave me a ceramic piece to “repair,” which I knew nothing about, and the sculpt clay worked very well. I could smooth the corner and it looked original. The miracle, however, was that the paint I mixed matched very closely. If you looked closely, you could tell where I painted it, but it was a little better than broken! Good luck. Andrea, I love your Dodo. I hope you will show us your other pieces. That is really great. Wish I lived closer because I would go see the exhibit. Thanks. Jonni, I never thought about how much it cost, as it was paid for by the company. I do know that because it was latex based you can thin it with water, and a little goes a long way. You’re right in that the sculpture on a float is pretty big. But I’ve used it to make some smaller pieces- about 18″ tall or so. I’m not sure about the waterproof resistance of crumpled paper painted with just the primer and paint. I had a gallon of the 3M Fastbond that I’d had for over a year and still had about half of it left, and I’d made a lot of sculpture. If you want to try the corrugated cardboard and pasteboard, I suggest you use the cheapest, flimsiest stuff you can find, usually the Chinese-made stuff. I suggest looking in the dumpsters behind cheap furniture stores. To make the smaller stuff, you just rip the cardboard into smaller strips. You build up the sculpture in strips and small pieces, building it up hollow, sometimes over a wooden or pvc armature depending on the size. 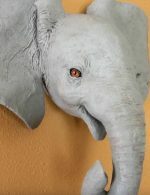 My uncle decorates his house in elephants, so I made him an elephant ottoman with a pvc armature and a solid structure. It’s lasted for years now with no damage from his feet and nieces and nephews riding on it. Just remember this is a three layer process. First layer is corrugated cardboard, second layer is pasteboard, and the third layer is butcher paper. Each of these layers smooths out the layer underneath it. Hey Jonni, Ari Kahn here. I used to build Mardi Gras floats in the Southeastern US. Each of these floats contained paper mache sculpture of one sort or another. We used to use chicken wire covered with heavy kraft paper and this noxious, petroleum-based contact adhesive that took a long time to dry. Later, instead of the chicken wire, we used corrugated cardboard covered with paste board and butcher’s paper. We used 3M Fastbond contact adhesive to glue the cardboard to itself. 3M Fastbond is a green, latex-based adhesive that cleans up easily with water when still wet, (but nothing will get it out when dry.) We’d cover the sheets of cardboard with the glue and let it dry. We then ripped it into strips and built up the structure. This was then covered in pasteboard (the kind of cardboard you find in cereal boxes), also coated in glue. This also had the added benefit of partially waterproofing the cardboard. This was then pasted over with white butcher paper and waterproof poster paste. The purpose of the pasteboard was to smooth out the corrugated cardboard and the butcher paper smoothed out that. This was finally painted over with Kilz primer then painted with exterior latex house paints This enabled the sculpture to hold up in all sorts of weather for years. We had sculpture that we’d been using for years and was still as good as the day it was made. I myself have made exterior decorations using this method and they were still going strong (at least they were when we moved.) I made a few sculptures like this using moulds, but you have to do them a bit in reverse. You first have to put in the pasteboard in the mould, then line it with the strips of corrugated cardboard. After you pull it from the mould, you then cover it with the butcher paper and poster adhesive. I hope this helps a fellow paper mache artist to build some outside sculpture. Thanks, Areya! This is great information. I looked up the FastBond on amazon.com, and it is expensive – about twice as much as other products that people use for waterproofing paper mache, like Flex Seal. However, the method you described has actually been tested for years, while we’re still experimenting with other products. I looked for waterproof poster paste and couldn’t find it. Is that like wallpaper paste? It sounds like the last few layers of paper are only protected by the Kilz primer – an outdoor version, I assume – and the exterior latex house paint. Is it possible that a paper mache sculpture created with a solid armature, made with crumpled paper or foil, could be made waterproof with just the primer and paint? I know I’m asking a hypothetical question here, but maybe you’ve experimented with it? Most of us make smaller sculptures than the ones used in floats. hi Jonni . 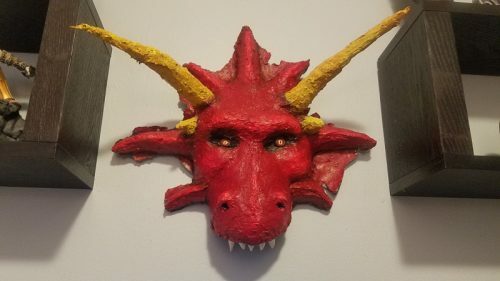 first time doing paper mache. I was gifted an armature of a life size sitting swan. skinned it 1/4 in. wire mesh. decided on paper mache for its light weight. It has to go outside when finished so, I believe I have found the right product to do that. what I have tested is roofing cement. not sure on the brand I was given a sample to test. I covered a box of hand soap in 8 layers of paper and paste. stuck In wire legs , looks like Spunge Bob. by the way I live in Lakeland Fl. and its rainy season. This product is like a thick water based house paint white, needs to dry 24 hours before exposure. easy to brush on. I put 4 coats on 24 hours apart. then kills primer and finished with acrylic paint. 5 weeks in my yard and a total now of 23 inches of rain. No mold No change. I think it works. That does sound exciting – and thank you for doing your test! Is there any way you might be able to find out which brand you used? Is it a product that’s used to seal cracks in the roof of mobile homes? I’m obviously not too well-versed in construction terms, because I don’t think I’ve ever heard of roofing cement before. Maybe it’s similar to the Flex Seal that Tom used on his life-sized bear? the roofing cement is made by black jack ,its used before new roofing goes on. applied to the drip edge and anything that protrudes the wood deck. you want white water based. they have black and if memory serves me, they have black oil based that’s nasty even putting it on a roof. Thanks, Phil. If I get a chance I’ll try it out. You have a such a great attitude it is enjoyable watching your videos. Especially, your trial and error approach to searching for a product that can stand up to outdoor elements. Have you tried “Paverpol” transparent? It is a liquid brushed on the finish piece. Originally, it was primarily used as a fixative for stiffening fabric, etc. Hi Martha. I’ve heard of it, but I haven’t tried it. Have you tested it on paper mache? Great website, thanks! 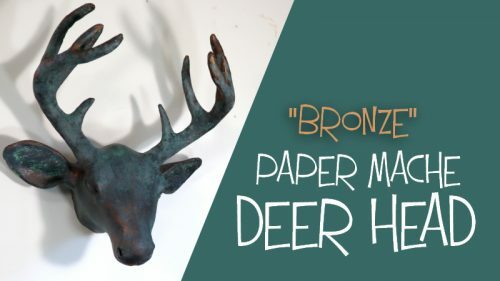 I’m hoping to be able to replicate the same paper clay form for trophy mounts over and over again and I wanted to know if you have any suggestions please as to the best way to do it? Thanks! Hi Jasmine. Have you already made your original sculptures for your trophy mounts? 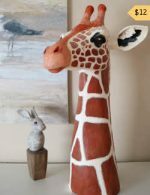 If you’re referring to my paper mache clay recipe, it will stick to a plaster mold unless a very good release is used – and that can put an oily surface on the copy, which could make it difficult to paint. Another problem is that it dries very hard, and if you have any undercuts in the original sculpture at all, the copy will get caught in a plaster mold and you can’t get it out. That’s why I would use a silicone mold instead. I like the Rebound 25 brush-on silicone product. You would want to do some experiments, because the paper content of the original paper mache clay recipe can sometimes make it hard to make a good copy. It also tends to dry very slowly when air can only get to one side of it. I’ve tried using the paper mache clay in molds in the past, and I wasn’t very happy with the results. However, I did create some trophy mounts with silicone molds several years ago with a different recipe, and I still have them. They’re thin-walled and lightweight, but much stronger than I had expected them to be. I explained the methods and recipe I used on this post. Take a look at it, and see if that might be a method that would work well for you. If you have any questions about it, don’t hesitate to ask. That bear is really nice! Wow! I am working on a sculpture at the moment, a fairly large one (not huge but good-sized) and i was wondering if it’s true that you need to allow each layer to dry individually before applying the next? If so, how long would you recommend letting each layer sit so it does not attract mold? Are there further tips for preventing mold in the first place? The materials I’m using are a a regular liquid craft glue paste and toilet paper (seems to be hardening very nicely so far). Thank you so much, love this website. Hi Christina. When you say “regular liquid craft glue paste,” are you talking about Elmer’s Art Paste? If you are, you shouldn’t need to worry too much about mold. If you’re using a starch-based paste, like the one made with flour and water, then you will need to make sure it dries quickly. However, I don’t usually recommend drying each layer one at a time. The reason is that the dry layer gets wet again just as soon as you add the second wet layer, and it’s easy to believe it’s dry all the way through if the second layer is dry, even if the first layer is still damp, but hidden. The fastest way to dry paper mache is to put it in front of a fan. Mold can’t live without water, so getting your paper mache dry quickly is always a good idea. If you are using starch-based paste, you can also add a few drops of oil of clove to slow down the growth of mold so you have time to get the piece completely dry. I hope this helps. Have fun with it! my name is Barbara and as of 4 years ago I started making paper mache’s to finish a Christmas tree I was donating to raise money for the disable. I surprised myself when I sculpted the faces by hand; I didn’t know I was capable of doing it. I have improved over the years and now find people asking if I sell my mache’s but I don’t know how to price them; can you help me? Hi Barbara. That’s a really hard question. 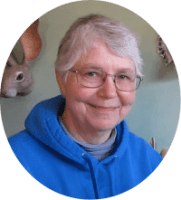 There are two ways to go about it – if you’d like to sell as a hobby, or to get some money back so you can buy more art supplies, you can imagine trading the item for a certain amount of money. If you feel it’s a fair trade, then that’s what you should ask for. If you want to turn it into a full-time job, then you’d need to figure out how many items you can make in a month, how much money you need to make in a month, and then price them so you can make a living at it. Then you would need to go “shopping” for similar items, perhaps on etsy.com, and see if your prices are higher or lower than your competition. No matter which way you go, there’s no easy way to do it. And in the end, it’s the buyer who really decides if a price is fair or not. Perhaps the next time someone asks if you sell your work, ask them how much they would be willing to pay for it. Do you have some photos of your work that you’d be willing to share? 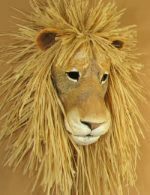 Jonni, I love your iron finish on your lion and have a question. Can you tell me the source of this iron material, is it a bottled product, powder ?? Hi Tom. I use the Type B iron coating from Sculpt Nouveau. It’s a liquid acrylic product with metal embedded in it. And I spray the second coat when it’s wet with their Tiffany green patina, which oxidizes on iron to a nice rust color. If you do a search on YouTube for the Brick in the Yard channel, you can see some great videos showing how to use the Sculpt Nouveau products. And I should also mention that I used their bronze coating with the green patina on my Ballerina Bunny. Advice/help. I have a scupt made from monster clay (wax clay). 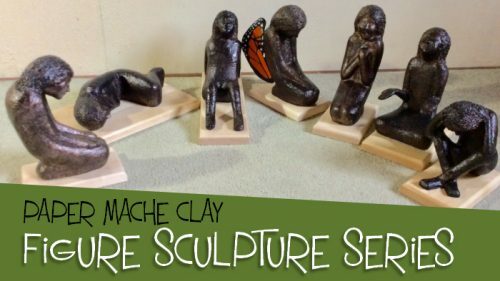 I know papee mache shouldnt hurt the clay but im wondering if there may be a good release to use? I want to make a few base pieces to detail but i also still want to keep the sculpt to refine its details and make a latex mask. Any suggestions or ideas for me to “think on” would be ao welcome! . Hi there, I’m working on a project in which I must cover a 3d printed large-scale sculpture with concrete, but concrete does not stick to plastic. If I covered the sculpture first with papier mache, would the concrete stick? Thanks! Hi Karin. Papier mache doesn’t stick to plastic, either. I’m not a concrete expert by any means, but it sounds like you need to attach something to the plastic that the concrete can grab onto, like stucco lath. It would need to be attached to the plastic form with screws, I assume. But again, this isn’t my area of expertise. You might want to contact your local concrete contractor and ask him for advice. Good luck with it! Hi Denise. You might want to contact local art galleries, museums or antique stores for a local referral. There might be someone in your town who could take a look at it and either fix it or tell you who could. Another possibility is your local university or community college art department. One of their teachers, or even a student, might be able to help. Good luck!